Upd Oct 17: It's two weeks late, but I finally have a fix for the problem pathlight. Sorry for the troubles everyone. 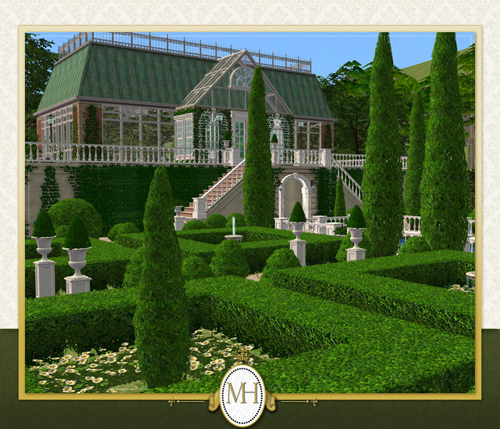 After a long wait, here is the second set in my Manor House Collection project (and my first upload post-MOCCA! Mmmmm...mocca...). 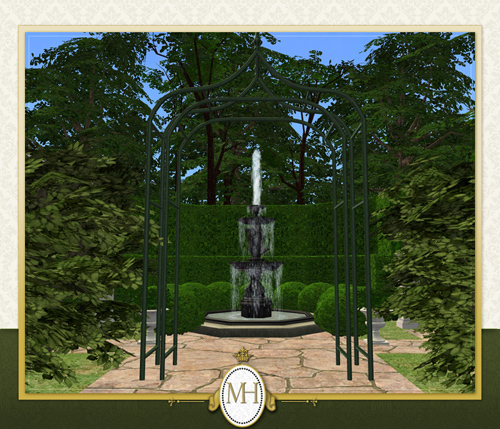 This is the Garden set, and features numerous topiary bushes and other garden-type things like urns and lampposts. 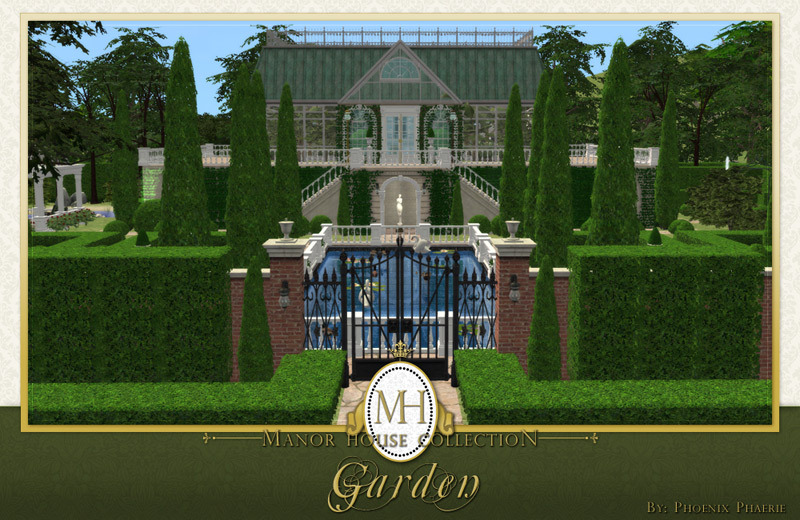 (please note that I used items NOT created by me, as well as unreleased Manor House Collection pieces in the following pics of the garden/conservatory). ETA: I made a mistake in the preview images. The tall thin tree should be labeled 'Hardwood', not 'Great Oak'. 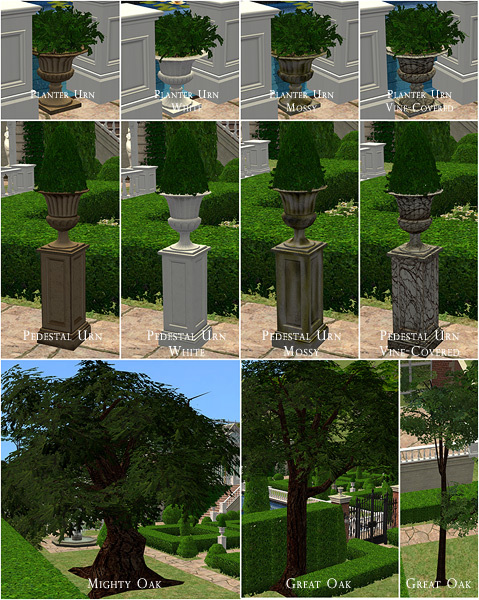 I've added a fix for both the pathlight and the topiary bushes. These fixes are NOT included in the MHGarden.zip file! Previous and first time downloaders alike MUST download these two zips if they want the fixed files in their game! Pathlight [fixed Oct 17].zip contains ONLY the pathlight file. Numenor was kind enough to come up with the fix for me, but I couldn't completely test it myself without uninstalling all of my EPs. I'm deferring to his superior modding skills and trusting that the fix will work for those who had the flashing purple problem. You must allow this file to overwrite the original cmmanorgardenpathlight file. PM me if you have further issues with the pathlight after installing the fix. 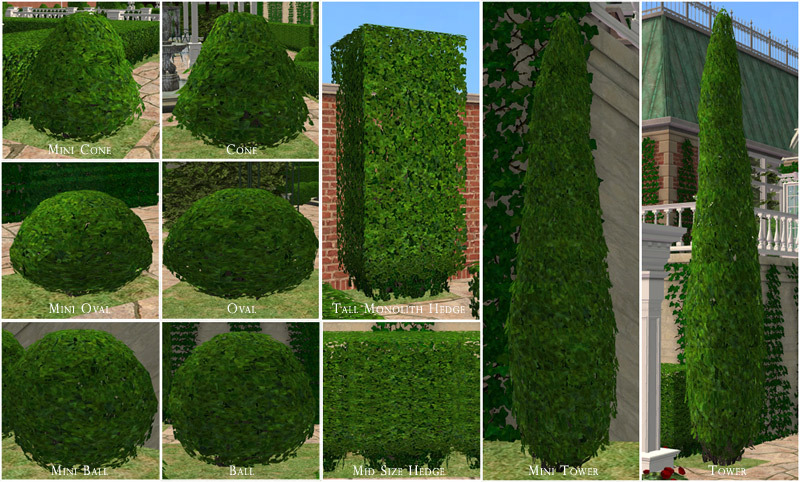 Topiaries [fixed Oct 17].zip contains ALL the topiary files, but they have been edited to prevent your Sims from walking through them. You only need download this file if you prefer your Sims didn't pass through the bushes. You must allow these files to overwrite the original topiary files.